Women’s jewelry boxes have been popular gifts for hundreds of years, and are as in demand as ever. The variety of styles, usefulness, and the heirloom quality that this gift offers denote a thoughtfulness and value to satisfy both giver and receiver. Almost every woman (as well as many men!) owns jewelry -- whether precious family heirlooms, wedding jewelry, or occasion-based jewelry (such as formal, informal, and “going out” styles). 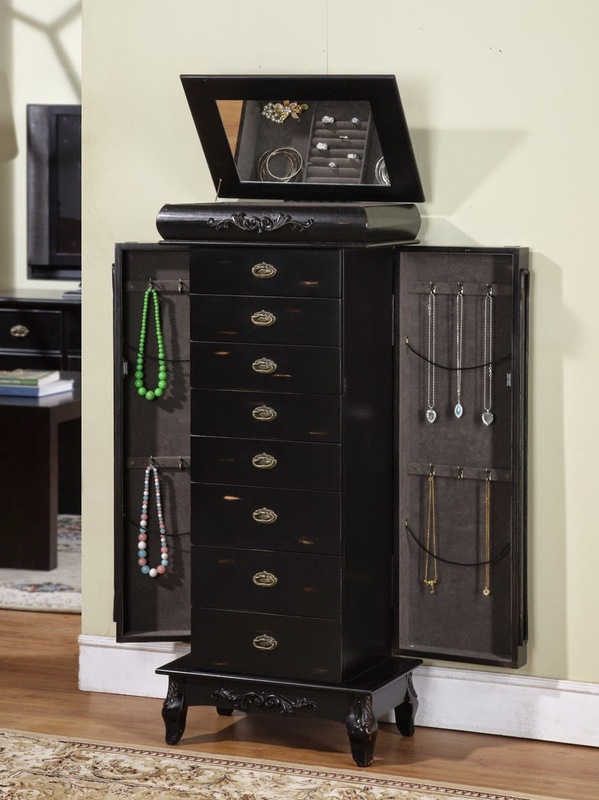 The size of the jewelry collection is therefore the initial consideration: If the woman in your life has a large collection of jewelry, as well as delicates such as lingerie or scarves, then a standing jewelry armoire is a great choice. These securely store every type of jewelry, and store necklaces exceptionally well due to the large swing-out sides. These types of jewelry boxes have larger drawers at the bottom for storing bedside delicates & lingerie. Smaller options for smaller collections are also available, like dresser-top armoires, and jewelry cases & chests. The next consideration will be the style, color, and price. The giver must know the recipient and shop around to find the right jewelry box. When purchasing online, always look for a good return policy & warranty. Generally speaking, the larger and more exotic the wood, the higher the price. Solid Cherry & Bubinga wood are the most common types of exotic wood. Cherry is especially popular due to its solid structure and Cherry wood smell. Women’s jewelry boxes remain popular not just because they serve the practical purpose of storing jewelry: they also add to a woman’s bedroom décor, so design is also an important consideration. Styles range from antique, traditional, to modern. The type of wood, paint, and leg (for the floor standing jewelry cases) define each, so that a jewelry box or standing jewelry armoire gift can be unique and tailored to the recipient’s need and tastes. And an engraved plate is an especially popular personal touch, especially when it denotes an anniversary or other special occasion. When looking for a special gift for the woman in your life, whether for her birthday, anniversary, or holiday, consider a jewelry box and the customizable aspects they offer: different sizes to accommodate any variety of jewelry collections, different styles to match her unique taste and décor, and different price points to fit any budget!